The Walking Dead cast are as much a family as their characters are on our TV screens. When one of the characters is killed off, both of those families lose a member. That's why Andrew Lincoln and the group aren't ready to talk about which character met their doom when Negan brought his bat down on their skull. "We kind of made a pact with each other, just because personally and professionally one of us is going," Lincoln tells ComicBook.com in an exclusive interview. "These people are lovely, dear friends. Including myself one of us is gonna get it." Talking to Lincoln earlier this week, it would've been foolish not to ask if he knows who the victim is. As it turns out, the scene hasn't been shot in its entirety but Lincoln still isn't willing to give up any info. "We all just made a pact not to discuss it," Lincoln explains. "It's upsetting. It's too precious. There are certain things that become sacred on set and I'm afraid, I'm one of these people going, 'I can't talk about it.' Every time we've lost somebody on the show they've been instrumental in story telling. It's the same thing. We lock up shop. We linked arms, got our knees, and said, 'You know what? Let's not discuss this. It's painful. No apologies.'" None of the cast or crew seem to be giving any hints as to who was killed off. Fans have been speculating and going as far as drawing up their detective works to try and figure it out but it looks like we'll have to wait for the show to come back to find out exactly what happened. 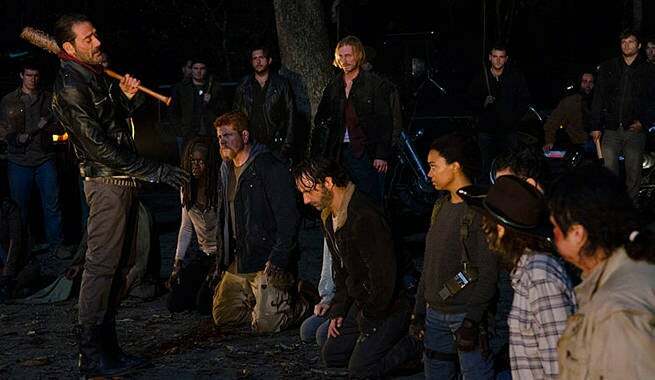 The Walking Dead will return for its seventh season in October. Expect a trailer to spawn from San Diego Comic Con in July.